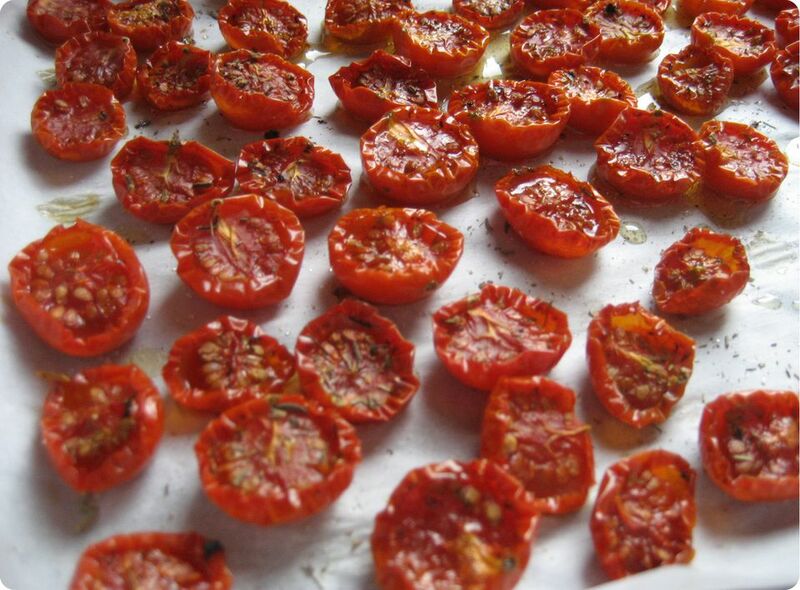 If you love traditional sun-dried tomatoes, try drying cherry tomatoes in your oven. The result is intensely flavored little rounds that can be used as a pizza or salad topping or in the same manner as standard sun-dried tomatoes. While it takes a few hours for the tomatoes to dry, there is very little prep time involved. Place rack in the center of the oven and heat it to 200 F.
Line a large baking sheet with aluminum foil. Cut the tomatoes in half horizontally and arrange them cut-side up on the baking sheet, touching each other. Bake for 2 to 3 hours. Serve hot, at room temperature, or cold. Sun-dried tomatoes will keep in an airtight container for one month in the fridge or three months in the freezer. These cherry tomato halves shrink to about three-fourths their original size, become a deep red in color, and have an intense real-tomato taste. They are a much brighter red than commercial sun-dried tomatoes and are an excellent accompaniment to meats. They also can be used as a flavorful topping for pizza or simply as a color accent to any dish. Source: Cookwise by Shirley O. Corriher (William Morrow & Co.). Reprinted with permission. Instead of plain salt, try garlic salt. In addition to salt, try black pepper, cayenne pepper, Italian seasonings, or other flavors. Sprinkle with fresh chopped parsley, basil, and oregano along with salt and pepper. Sometimes you want to bring sun-dried tomatoes back to life. With their pungent, strong, tomato flavor, they are a great addition to many dishes, but not so great-tasting when crunchy. You can reconstitute them in water or oil. In either case, don't throw the water or oil away after steeping the tomatoes in it; the flavored liquid is exquisitely mixed with other ingredients. To reconstitute in water, place the number of sun-dried tomatoes you require in a heatproof bowl. Completely cover them with boiling water. Let steep for at least 30 minutes or until the tomatoes are pliable. Drain, pat dry, and slice or use in whatever manner your recipe directs. To reconstitute in oil, place sun-dried tomatoes in good-quality olive oil and let steep at room temperature, covered, for 24 hours before using. Drain, pat dry, and use the tomatoes as your recipe instructs and use the flavored olive oil in cooking.